This listing is for a slightly used VWR Magnetic Lab Stirrer. The ceramic top has a platform of four inches by four inches and runs on standard 115V voltage. 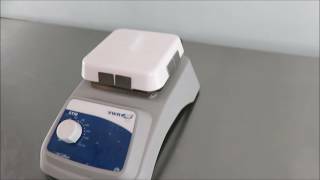 These VWR Magnetic Stirrers are all belt driven and come with manual adjustable control to set the desired speed. Contact us with questions about any of our used lab equipment listings. Dimensions 12"x 7" x 6"
Item has been fully tested and comes complete with our standard warranty. Instrument ready to ship with a 1-3 day turnaround time, contact us with questions.